Malolo is a Bahama/World-ready cruiser, designed for speed, and long-term live aboard comfort. 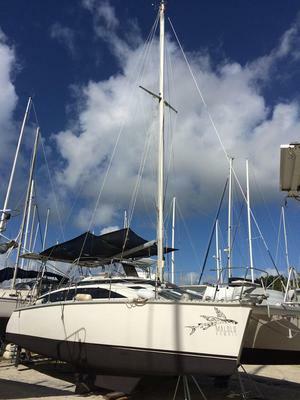 Her 3’ shoal draft and easy to handle sail plan make it a go anywhere, FUN, boat. 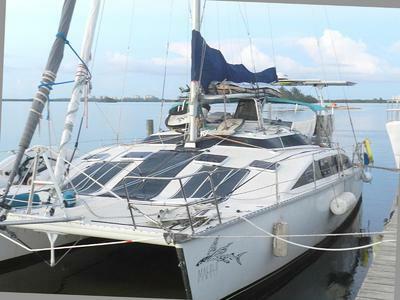 If your plans are to coastal cruise, club race or an extended trip into the Caribbean Sea on a budget this is your boat. She has the sought after three cabin one head layout. 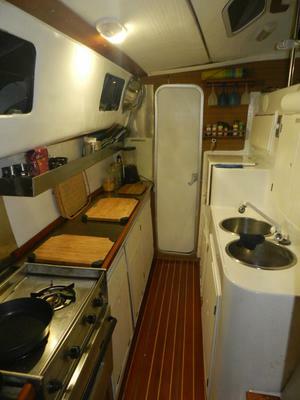 The remodeled galley with stainless counters and shelving is down offering large prep areas and safety for the cook. Much attention has been paid to functional storage that doubles as seating. The Davit system includes a Hammock back bench. The storage room has storage shelves the fold out into additional sleeping quarters. 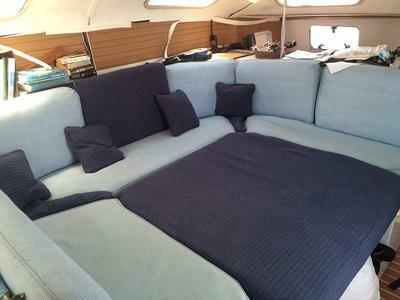 The main salon has triple configuration with storage/bed, storage and or open seating. The battery banks were recently doubled with over 400 amp hours of AGM batteries, 690watts of Solar was added with a floating panel that can be articulated for morning or evening solar exposure. The fuel capacity 65 gallons. Cockpit function and comfort was also greatly enhanced with the addition of a custom extra long dock box/bench with cushions and hammock back for comfort and safety. Includes twin Yamaha high thrust motors and a full motor spare on board. 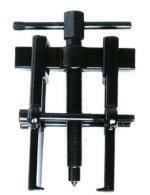 She also features heavy duty hinged 3’ Hull Extensions that can be folded up if needed. Head sails are on new Colligo continuous furler. Genoa, Jib and a fully battened main, and a 325 sf. 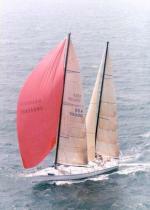 Spinnaker. Brand new synthetic rigging in 2014. Synthetic life lines. New Raymarine Autopilot, Chart Plotter and Wireless Quantum Radar.